Spring has sprung and March Madness has begun! Four days ago marked the start of the NCAA tournament and, since then upsets and, unfortunately, imperfect brackets, have been plentiful. This past Friday, Liberty (No. 12) captured its first NCAA tournament win in school history with a 80-76 win over Mississippi State (No. 5). Liberty, down with 7 minutes to play, pulled within one before Lovell Cabbil Jr. drilled a three-pointer with less than two minutes left to take the lead. The Bulldogs unfortunately couldn’t answer, failing to take advantage on the next two crucial possessions, while Liberty made free throws. 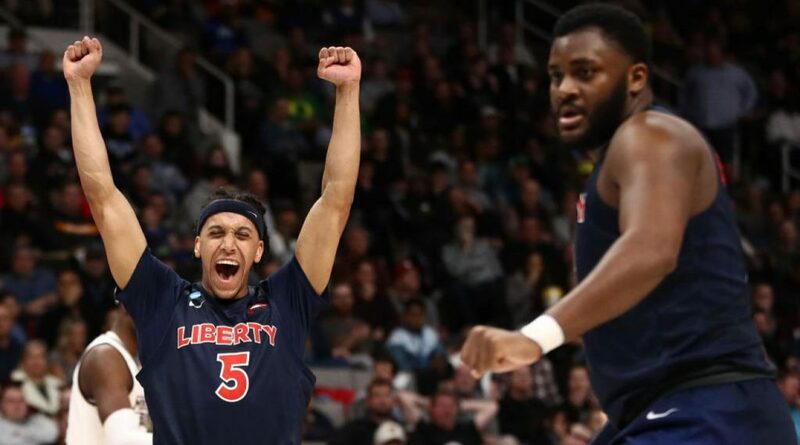 Liberty’s Caleb Homesley had a game-high 30 points and Mississippi State’s Quinndary Weatherspoon countered with 27 points. The Flames faceoff against Virginia Tech in the second round. Ohio State (No. 11) topped Iowa State (No. 6) 62-59, behind 21 points and 12 rebounds from Kaleb Wesson. The Buckeyes had a bit of a scare when Virginia transfer Marial Shayok, who had a game-high 23 points, took a one-point lead with 3:40 left in the game. However, Ohio State scored the next five points and never gave back their lead. With seconds left and down three, Nick Weiler-Babb had an open three-point shot for Iowa State to tie the game, but it bounced off the rim wide as he tried to garner a foul on his follow-through. UC Irvine has pulled off the largest upset of the tournament thus far and earned their first tournament win in program history by knocking off Kansas State in San Jose. UC Irvine’s Max Hazzard and Evon Leonard led the Anteaters with 19 points each, while Kamau Stakes had 18 points for the Wildcats. UC Irvine’s roster includes the sons of Doc Rivers and Caron Butler. The Anteaters have won 17 consecutive games and improved to 10-0 this season decided by 6 points or less. Kansas State was playing without forward Dean Wade after a foot injury. Wade, who averaged 12.9 points and a team-high 6.2 rebounds per game, also missed last season’s NCAA tournament with a broken foot; however, the Wildcats still managed to advance to the Elite Eight (thewashingtonpost.com). Games to look out for this upcoming Thursday and Friday include Sweet 16 games between LSU and Michigan State and Florida State and Gonzaga. Junior Gabby Goodwin is the Editor-in-Chief. Her email is ggoodwin.edu.